For more than a century, Indian families have seen valuable land resources diminish as fractionated ownership increases with each passing generation. 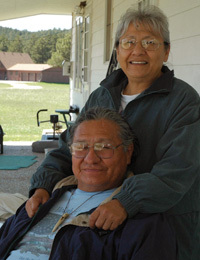 ILTF supports estate planning as one of the most effective ways to stop the continued division of Indian land titles and ensure that Indian lands are controlled and managed by Indian people. Over the past several years, ILTF has funded projects that provide education and free estate planning services for tribal members across the Pacific Northwest, North Dakota, South Dakota and Minnesota. As a result, more than 3,000 landowners have received direct legal service and will writing assistance. In addition, more than 6,800 people, including elected tribal officials, landowners, attorneys and Indian land heirs have received training through ILTF-funded estate planning programs. Today, ILTF continues to build upon its estate planning and probate program by developing new, more efficient and cost-effective models for helping Indian people safely transfer their lands from one generation to the next. ILTF is currently working directly with qualified contractors throughout the country who provide specialized legal and will writing services and training to tribal members in the communities and on the reservations where they live. By providing services that reduce fractionation, and training that informs Indian people about the laws governing land ownership and transfer, ILTF empowers tribes and individual landowners to protect their land assets and preserve economic and cultural resources for future generations. In 2015, the U.S. Department of the Interior awarded a $350,000 grant to ILTF to provide estate planning services, with an agreement to provide additional funding to continue this work through 2017. The scope of the project is gradually transitioning from direct legal services for beneficiaries to policy development for wills and family associations. Services are being provided in Arizona, Minnesota, Montana, New Mexico, Oklahoma and Wisconsin through partnerships with local law firms. These efforts served 229 clients and executed 319 estate planning documents in 2015.